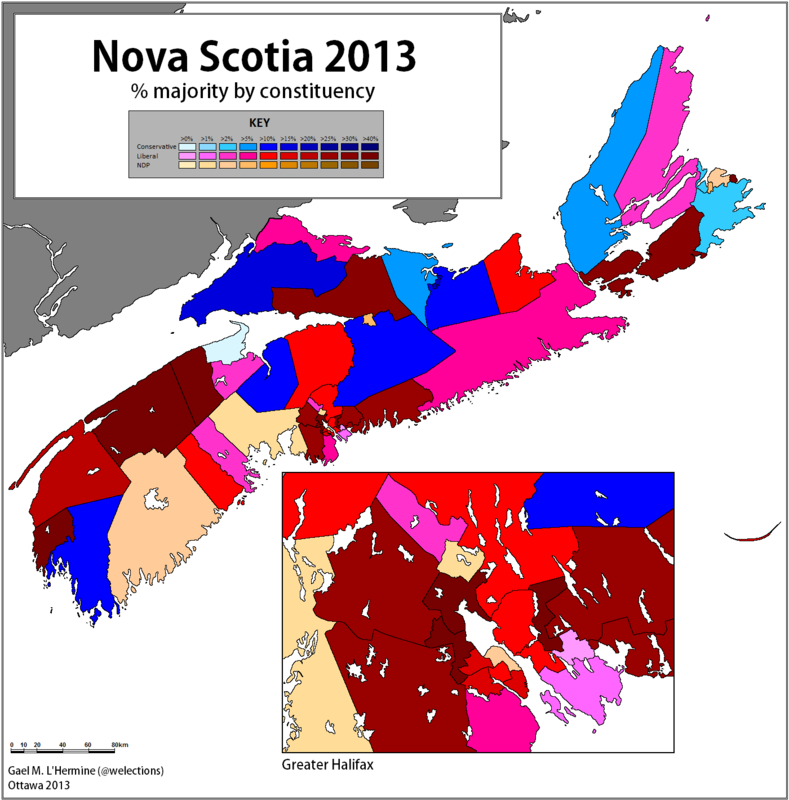 Provincial elections were held in Nova Scotia (Canada) on October 7, 2013. All 51 members of the unicameral provincial legislature, the Nova Scotia House of Assembly, elected by FPTP in single-member districts, were up for reelection. The electoral map was significantly redistributed last year, resulting in the net loss of one district: rural Nova Scotia lost three seats, while the Halifax Metro gained two seats. The abolition of four specially designated ‘minority’ ridings – three Acadian seats and one black seat (all of which had smaller populations than the provincial average) – caused a small uproar. The net political effect of the new map favoured the governing New Democrats (NDP), who would have won won two more seats than they actually did in the last election, while the Liberals would have won two fewer seats and the Progressive Conservative (PCs) would have won one seat fewer. Nova Scotia is Canada’s seventh most populous province, with a population just under one million (921,727) in 2011, and is the most populous province out of the four Atlantic provinces. In economic terms, Nova Scotia has the highest GDP of all four Atlantic provinces, although it only accounts for 2.1% of the country’s GDP. Canada’s Atlantic provinces have tended to be significantly poorer and more economically depressed than the rest of Canada, and all of them were known as ‘have-not’ provinces until recently. Although Nova Scotia is by no means wealthy compared to the rest of Canada, it has historically been better off than other Atlantic provinces, although recent oil-fueled prosperity and growth in Newfoundland has very much altered that. For example, Nova Scotia’s unemployment rate (8.6%) is high compared to the rest of Canada, but it is still the lowest of the four Atlantic provinces. However, Nova Scotia’s GDP per capita is the second lowest of all provinces, and 17.4% of the population were low income after-tax (compared to 14.9% across Canada). Nova Scotia’s economy is in good part reliant on federal equalization payments, to the amount of $1.458 billion in 2013-14. The province’s contemporary economy is largely driven by the tertiary sector. The largest industries (NAICS classifications) in 2011 were retail trade (12.6% of the labour force), health care and social assistance (12.3%), public administration (9.7%), education (8%), manufacturing (7%) and construction (6.7%). Traditional industries such as agriculture, fishing and forestry employed only 3.8% of the labour force and mining an infinitely small share (0.8%). Nova Scotia’s traditional primary and secondary sectors have declined in the last decades. Fisheries once formed an integral part of the provincial economy, due to the proximity of rich offshore (and inshore) stocks, but overfishing in the late 20th century led to the collapse of cod stocks and resulted in major jobs loses and drastic federal quotas on catches. Mining (largely coal) also played a considerable role in the province’s economy, especially on Cape Breton Island (Sydney) although there were fields in Pictou and Cumberland counties on the mainland. Mine closures, in addition to the loss of other major industries (a large steel mill in Sydney) have left Cape Breton Island significantly economically deprived. Manufacturing and other industries include or have included steel (Sydney – closed down, Trenton), pulp and paper (Liverpool/Brooklyn – closed in 2012, Port Hawkesbury etc), frozen food/fish and agricultural processing (Lunenburg, Oxford, Canso), petroleum refining (Dartmouth), Michelin tires (Bridgewater, Granton, Cambridge) and power generation (Dartmouth, Trenton, Industrial Cape Breton). Shipbuilding in towns such as Pictou or Shelburne used to be major industries (the famous Bluenose schooner, which appears on the Canadian dime, was built in Lunenburg in the 1920s, but declined after the advent of steam and steel. The Halifax metro has performed better than the rest of the province, benefiting from the concentration of more stable employment in the public sector (including defence – Halifax is home to the large HQs of the CF’s Maritime Command), finance, services, healthcare and education. Halifax’s unemployment rate in September 2013 was 6%, significantly below the provincial but also national average. Halifax is a ‘college town’ home to Dalhousie University, St. Mary’s and the University of King’s College. Antigonish (St. FX) and Wolfville (Acadia) are also major college towns. Halifax saw the highest population growth between 2006 and 2011 (+4.7%), most other counties lost population. Cape Breton Island has been particularly afflicted by depopulation, having regularly lost population in almost all recent censuses. Nova Scotia is more ethnically diverse than other Atlantic provinces, although by national standards it is heavily white and native-born. 95% of the population is white, three-quarters of the population was born in the province and 91.8% have English as their mother tongue (French: 3.4%). These statistics hide some interesting tidbits and greater ethnic diversity within the ‘white Anglo’ population. Blacks constitute 2.3% (about 20,000 people) of the provincial population and form, by far, the largest visible minority in the province. While most black Canadians immigrated to Canada in the more recent past, Nova Scotia’s substantial black population has far deeper roots. Most came as free ‘black Loyalists’ after the American Revolution or as ‘black refugees’ during the War of 1812, and settled in the Halifax area. Many black Nova Scotians faced racism and discrimination, and lived in deplorable conditions. The town of Preston, outside Dartmouth, has a large black majority (69%). 39% of the population reported their ancestry (multiple response) as ‘Canadian’, a term which seems to indicate a long-time, settled Anglo-Protestant population which has lived in Canada for hundreds of years. Some 73% reported European ancestries, the largest being Scottish (31.2%), English (30.8%), Irish (22.3%), French (17%) and German (10.8%). This gives Nova Scotia the second highest proportion of persons claiming Scottish and Irish ancestries and the third highest proportion claiming English ancestry of all provinces or territories. Like in New Brunswick, many English Nova Scotians are of United Empire Loyalist descent and settled in the province following the American Revolution. Cumberland County, Shelburne County and the Annapolis Valley have the largest English populations. Most Scots settled on Cape Breton Island or Pictou County; over 50% of the population in Pictou, Inverness and Victoria counties (the last two are on Cape Breton) and Gaelic was widely spoken in northern Nova Scotia and parts of PEI until the late 19th century. Most Irish are found in Antigonish County. Nova Scotia remains a small French/Acadian minority, and an even smaller French-speaking minority. Those claiming French ancestry are concentrated in Yarmouth and Digby counties in southern NS or in Richmond County (Cape Breton Island), with some sizable numbers in Inverness and Antigonish counties. 30.5% of the population of Digby County claim French as their mother tongue, and Francophones constitute about three-fifths of the population in Clare municipal district. There are isolated French-speaking communities in Yarmouth County (20.3%), Richmond County (Isle Madame, 22.8%) and Inverness County (Chéticamp, 13.1%). Acadians in other parts of the province, notably Antigonish or Guysborough County, have been Anglicized. Nova Scotia has the largest German (and Dutch, 3.6%) population of the Atlantic provinces. A significant German Protestant population settled in Nova Scotia, particularly Lunenburg County, during early British colonial rule – they were brought in as ‘Foreign Protestants’ by the British to counterbalance the Acadian and native (Mi’kmaq) populations after Britain acquired Nova Scotia from the French. Lunenburg County, by far, still has the largest German population in the province; 32.1% claimed German ancestry in 2011. 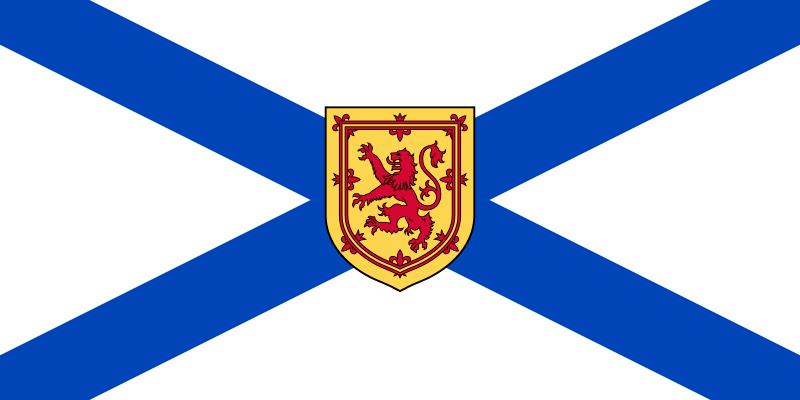 76% of the Nova Scotian population is Christian and 21.8% have no religious affiliation. 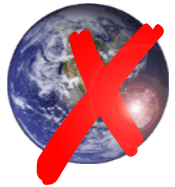 In more detailed terms, 33% of the population is Catholic, 12.1% are adherents of the United Church of Canada, 11% are Anglican and 8.9% are Baptist. The relatively large Anglican population and the large Baptist population (second largest, proportionally, after New Brunswick) is a sign of the province’s large stock of descendants of the United Empire Loyalists. Catholics constitute a large majority of the population on Cape Breton Island, with the exception of Victoria County, which saw more English settlement; and also in Antigonish County. Pictou County, Guysborough County, Halifax County and the Acadian counties of Digby and Yarmouth also have sizable Catholic populations; in contrast, the Catholic population in the Anglo/German counties is quite small. The contentious issue of religious schools, which has been a hot topic of religious (and linguistic) strife in Canadian history, was settled prior to Confederation in Nova Scotia (in 1865) with the adoption of non-denominational schools and allowed after-school Catholic religious education in schools. Nova Scotian political culture is both similar to and dissimilar to the general political culture of the Atlantic provinces. As in other provinces, provincial politics have been highly influenced by parochialism, tradition, conservatism, pragmatism and a dose of cynicism and caution. However, unlike in the other provinces, the traditional Liberal/Conservative duopoly in provincial politics has been successfully challenged by the NDP. Ideology and issues have played a relatively minor role in Nova Scotian politics, historically. Since pre-Confederation days, observers have pointed out that few if any meaningful issues or ideologies divided the Liberals and the Conservatives. Both parties reached their positions more on grounds of political expediency rather than principles; for example, the early Liberals opposed expanding the franchise and fought against abolishing the upper house. To this day, both the Liberal and Conservative (PC) parties are moderate, pragmatic and ideologically similar parties while the incumbent NDP government adapted itself to the terrain and governed in a similarly moderate and fairly non-ideological fashion. No great ethnic, religious, class or ideological antagonisms have had a strong, lasting influence in Nova Scotian elections. Some ethnic and religious voting patterns have been evident, notably with Acadians in particular and Catholics in general tending to lean towards the Liberals. However, unlike in many other Canadian province, the religious cleavage in vote choice at the provincial level has been far less pronounced. Religion and religious conflict has played a role in Nova Scotian politics, notably in pre-Confederation days or in 1954, but the ‘schools question’ was never a major political issue in the province and both parties effectively catered to both Protestants and Catholics. The provincial Conservatives have been considerably less hostile towards Catholics than their counterparts in other provinces and, as a result, they have at times managed to appeal strongly to Catholic voters. Class politics and the union movement (with industrial workers in steel mills and coal mines) have been more prominent in Nova Scotia than in the other Atlantic provinces, explaining the strength of the CCF/NDP compared to other Atlantic provinces. Class politics and unionization ran highest on Cape Breton Island, historically more influenced by post-Confederation immigration and the tenets of British trade unionism, and Cape Breton Island is where the labour movement found most of their support. However, with that exception, class consciousness has never been particularly high in the province. Family ties, traditional loyalty, local caution and conservatism as well as patronage sustained the Liberal/Conservative duopoly for well over a hundred years. Patronage in the public sector subsisted well into the 1950s, and pork-and-barrel ‘highway politics’ or the granting of government contracts to party friends continued to be the rule well beyond that. Today, while partisan loyalties are much less solidly entrenched, personality and local party organization plays a large role. Nova Scotia had a long and rich political history prior to it joining Canadian Confederation in 1848. The House of Assembly was the first legislature in Canada, created in 1758, and Nova Scotia was the first British colony to gain ‘responsible government’ (government responsible to the elected legislature) in 1848, under the leadership of Joseph Howe – who had already led to the creation of the Liberal/Conservative party system in 1836. When Nova Scotia joined Confederation, it did so under the leadership of the pro-Confederation Conservative Premier Charles Tupper (1864-1867). However, the majority of Charles Tupper’s constituent did not follow him into embracing Confederation with the Canadas in 1867. When Nova Scotia joined Confederation, it was still experiencing a ‘golden age’ because of reciprocity, shipbuilding, lucrative custom duties and international trade; the conservative and cautious people of Nova Scotia, fearing the loss of self-government and the imposition of direct taxation (a major issue in early provincial politics), resisted Confederation. You think that Quebec was the first Canadian province to elect an outright separatist government in 1976? Think again. Nova Scotia, in 1867, spearheaded by anti-Confederation leader Joseph Howe, elected an overwhelmingly anti-Confederate majority both to the House of Commons in Ottawa (17 of the province’s 18 seats) and to the House of Assembly in Halifax (36 anti-Confederation Liberals against 2 pro-Confederation Conservatives). Joseph Howe immediately went to London to attempt to “repeal” Confederation, but the British refused and Howe quietly accepted the resolution, as did most of his partisans (although the Liberal/anti-Confederation Premier of Nova Scotia, William Annand, proved more radical, but he was a non-entity and was pushed out in 1875). In a sign of the legendary pragmatism of Nova Scotia’s politicians, Howe and most of his followers decided to seek “better terms”for Nova Scotia within Canada – he went as far as joining Prime Minister John A. Macdonald’s cabinet as President of the Privy Council (1869-1873) and Secretary of State for the Provinces (1869-1873). Likewise, 10 Anti-Confederation MPs in Ottawa joined Macdonald’s very pro-Confederation Conservatives. However, the anti-Confederation party in provincial politics evolved to become the provincial Liberal Party. Between 1867 and 1956, Nova Scotia had a one-party (Liberal) dominant system – the NS Liberals governed between 1867 and 1878, between 1882 and 1925 and again between 1933 and 1956. The Liberals’ 43-year old on power between 1882 and 1925 remains, to date, the longest unbroken one-party hold on power in Canada, although the Alberta PCs will break that record in September 2014. The Conservatives won the 1878 election because of a recession, but the Liberals regained power in 1882 and entrenched themselves. The long era of provincial Liberal dominance, not replicated in federal elections, owed a lot to strong organization (the Liberals built a strong, cohesive province-wide organization, while the Conservatives did not organize province-wide until 1896 and had weak local branches until the 1950s) and able leadership. Indeed, the provincial Conservatives lacked strong leaders: able Tory leaders made their mark in federal, not provincial, politics until the 1960s: Nova Scotians John Thompson, Charles Tupper and Robert Borden all served as federal Tory leaders and Prime Minister of Canada, years later Robert Stanfield took the leadership of the federal PCs during the Trudeau era. In contrast, provincial Tory leaders usually served short periods of times, many failed to win their seats and none of them left a mark on provincial politics unlike the succession of long-serving Liberal Premiers until 1954. FPTP magnified and exaggerated the winning party’s majority in the legislature, but the popular vote was often far tighter than the seat count. Between 1871 and 1945, the Conservatives dropped below 40% of the vote only once (1920); the Liberals’ best PV result was 56.7% and dropped below 40% only once between 1867 and 1963. William Stevens Fielding, the Liberal Premier between 1884 and 1896, was the province’s first major Premier. In the 1886 election, angered by Macdonald’s treatment of NS and opposing the Conservatives’ fiscal and tariff policies, Fielding ran on a separatist platform calling for repeal of Confederation. He handily won that election, but he was unable to do that and he quickly became a pragmatist in the line of Joseph Howe. Fielding was the first Premier who took a more active interest in the workings of government, with projects such as building roads and inducing outside interest in developing the province’s coal reserves. Along with Ontario Liberal Premier Oliver Mowat, he became a powerful advocate for provincial rights and in 1896, after helping Wilfrid Laurier’s federal Liberal electoral campaign in NS, resigned to join the federal cabinet where he had a long and illustrious career as Minister of Finance between 1896 and 1911 and again between 1921 and 1925. His successor as Premier, George Murray, ruled the province for 27 years between 1896 and 1923. This is the longest unbroken tenure for a Canadian head of government, but Murray made no mark on Canadian history and is not as prominent in provincial history as his predecessor and some of his successor. Murray was an affable, moderate and pragmatic leader who was a master of patronage and brokerage politics, carefully balancing labour and capital interests. He was, however, not an innovator – he admitted as much himself, saying he did not want to be a vanguard of public opinion. He refused any initiative which had not proven successful in Ontario. The 1920 election represented a short-lived deviation from the established political order. United Farmers and Labour candidates won 30.9% of the vote against 24.7% for the Conservatives, forming the Official Opposition with 11 members to the Tories’ 3. The industrial working-class had been hit by the post-war slump, increased freight rates, lower demand for steel, the steep rise in the cost of mining coal and the long, expensive haul to central and western Canadian markets. The Independent Labour Party was formed on Cape Breton in 1917 and on the mainland in 1917. Farmers had widely divergent interests but the economic difficulties, dissatisfaction with the political order and a wage-price squeeze briefly allowed them to federate as their brethren did, with even more success, in Ontario and the Prairies. The United Farmers of Nova Scotia were born in 1919. Murray aptly called an election before either new group could get organized and the press widely denounced them as socialists and Bolsheviks. Once elected, the Farmer-Labour group made a poor impression and the Conservatives quickly recovered. Indeed, the Conservatives won the 1925 and 1928 elections by attaching themselves to the Maritime Rights movement, active in the 1920s, and effectively serving as the spokesman for discontented Nova Scotians prior to the Great Depression. The Conservatives won 40 out of 43 seats in 1925, and the new Premier, Edgar N. Rhodes, demanded genuine financial concessions from Ottawa in terms of trade, taxation, fisheries and freight rates. Other achievements included abolishing the upper house, administrative reform, teachers’ pensions and allowances for widowed mothers. However, having been reelected by a tight margin in 1928, the Conservatives were in office when the Great Depression struck and where thrown back out of office by the Liberals in 1933. Angus L. Macdonald, the Liberal Premier between 1933 and 1940 and again between 1945 and 1954, became one of Nova Scotia’s most famous Premier. Macdonald was an impressive orator, a master of new means of communication, had an engaging personality and an attractive biography – a man who rose from humble Catholic Gaelic origins on Cape Breton Island to become a leading law professor. Macdonald perpetuated old Nova Scotian political traditions of patronage, pork-and-barrel road construction (highway politics) and rewarding party friends with jobs and contracts; but Macdonald favoured a more interventionist and activist government, both provincially and federally, than Murray had. His government introduced old age pensions, passed modern labour/union legislation, paved roads and promoted rural electrification. Macdonald, like many of his predecessors, was a vocal advocate of the province’s interests in federal-provincial relations. He argued in favour of federal aid to provinces based on province’s needs, and that Ottawa should assume full responsibility and exclusive jurisdiction over unemployment insurance, old-age pensions and mothers’ allowances. With the outbreak of war and the 1940 federal election, Macdonald became Minister of Defence in Mackenzie King’s federal Liberal wartime government in Ottawa between 1940 and 1945. He was replaced as Premier by his Highway Minister, A.S. MacMillan, whose five-year tenure was relatively unremarkable but gave the Liberals a third term in office in the 1941 election, which was the first election in which the Cooperative Commonwealth Federation (CCF), today’s NDP, won seats (it had won its first seat in a 1939 by-election), taking three seats – all from Cape Breton, where the CCF had been endorsed by District 26 of the UMW. Macdonald returned home in 1945 and took his old job back. Less than two months later, he led the Liberals to a landslide victory in which the Conservative vote fell by 13% to 33.5% and were completely shut out of the legislature, leaving the CCF’s caucus of two (both from Cape Breton) to assume the role of Official Opposition. However, as in 1920, the Conservatives had a phoenix-like rising from the ashes, under a young Robert Stanfield, who became the PC leader in 1948. Macdonald continued his advocacy for provincial rights in his second term and invested heavily in education, although his second term – from 1945 to his death in 1954 – was not as successful as his first term. The Liberals won reduced, albeit comfortable, majorities in 1949 and 1953. The PCs were reborn, while the CCF maintained a small and very regionalized (Cape Breton) presence in the legislature until they lost their last Cape Breton seat in 1963. When Macdonald died in 1954, the Liberal Party split along confessional lines, with the Liberals ousting Macdonald’s successor as (interim) Premier, the Catholic Harold Connolly, in favour of the Protestant Henry Hicks. Hicks took the ill-advised decision of raising taxes to finance the provincial education system. This, combined with the loss of Catholic support due to the 1954 confessional split, led to the Liberals’ defeat against Stanfield’s PCs in the 1956 election. It was very close contest, one of the few which didn’t result in an awfully disproportional seat count, but 1956 – or perhaps Stanfield’s landslide third term reelection in 1963 (56% and 39/43 seats) – marked the definitive end of Nova Scotia’s one-party dominant era and the long period of Liberal rule broken by short-lived and forgettable Tory administrations. Stanfield came from a rather different social milieu than Macdonald – part of a wealthy Truro WASP textile family, but he was a hard-working, honest, and humble man and gained the same slightly paternalistic, elitist ‘father figure’ image that Macdonald had. Stanfield, who was Premier of Nova Scotia until he won the federal PC leadership in 1967, was the quintessential Red Tory – centrist, pragmatic, supportive of government intervention, moderate if not progressive. Under his premiership, the provincial government played an active role in the province’s economic development. Some of his government’s policies included increased funding for education, comprehensive secondary schools, removing the worst aspects of party patronage (creating a professional bureaucracy and respecting the Civil Service Commission, set up in 1935 but used by the Liberals as a shield for their patronage) and setting up a hospital insurance scheme. More famously, he created a Crown corporation to attract private investment to the province – including a heavy water factory, a colour TV factory and auto assembly plants. Stanfield was replaced by G.I. “Ike” Smith, whose term was plagued by economic problems. The owner of the Cape Breton coal mines and steel mills had announced in 1965 its intention to close its mines on the island within 15 years, which led the federal Liberal government, in 1967, to nationalize the mines in a new Crown corporation which would focus on operating and phasing out the mines and developing new economic opportunities. In 1967, that same company announced the closure of its Sydney steel plant, leading Smith’s government to nationalize Sydney Steel. The province was also forced to take ownership of the colour TV factory and a heavy water plant. Smith’s tenure was not without its achievements, but the PCs narrowly lost the 1970 election to Gerald Regan’s Liberals, with a minority government. The NDP won two seats, again on Cape Breton, the first seats in seven years. During the campaign, Regan had said that he found Smith too socialistic, but that didn’t keep the Liberals from favouring government intervention just as much. To be sure, Regan’s election ushered in a more businesslike and technocratic style, but the government played a large role in promoting offshore oil and gas exploration on Sable Island and created a new publicly-owned power system (Nova Scotia Power) by taking over a privately-owned company. The Liberal government provided free drugs for pensioners, free dental care for schoolchildren, formulated Canada’s first freedom of information act and introduced collective bargaining for fishermen and public servants. Regan’s Liberals were reelected in 1974, defeating the PCs, led by the more populistic John Buchanan since 1971. However, voters punished the Liberals for high utility prices, a poor economy and unfulfilled promises in the 1978 election, in which the PCs won 31 seats to the Grits’ 17 and a record 4 seats for the NDP (again, all from Cape Breton). The NDP’s difficulty to win seats on the mainland upset the party’s Haligonian party establishment and led to internal battles. The middle-class and ‘urban progressive’ Haligonian win won out, with Alexa McDonough, but a rogue Cape Breton MLA, Paul MacEwan, was expelled from the NDP in 1980 and founded the Cape Breton Labour Party in 1982, which emphasized working-class issues more than the new Haligonian NDP leadership. Premier John Buchanan’s PCs were reelected in 1981, in which the Liberals won only 33% of vote and in which the NDP won its first seat on the mainland (MacEwan was reelected on Cape Breton). Buchanan’s government negotiated an offshore development agreement with Ottawa and reorganized the fisheries sector; on the other hand, he faced a number of economic and political problems. The man who would later become known as ‘Teflon John’, however, remained very popular with voters, who liked his ‘down-to-earth’ populist style. He was reelected with an increased majority in 1984, while the Liberals won only 31% and 6 seats – their leader not among them. The NDP, criticizing the government’s cuts in social services, won three seats – all on the mainland this time. Buchanan’s third term proved difficult. Oil and gas exploration gradually stopped after an underwater gas well exploded and federal oil grants were phased out. The industrial town of Glace Bay (Cape Breton) was hit hard by a mine fire, a fisheries plant burning down and the closure of the two heavy water plants by Ottawa – while Sydney Steel continued to face a host of problems. Other parts of the province, however, saw greater economic success. The PCs were plagued by a variety of scandals involving many cabinet ministers and PC MLAs. For example, the Deputy Premier was forced to resign after revelations that he had pressured banks to write off some $140,000 in personal loans in 1980 and the attorney general’s office had later interefered with an RCMP criminal investigation into the matter. The government was also hurt by a judicial inquiry into the case of a Mi’kmaq man convicted to 11 years in jail for a murder he did not commit; the investigation revealed incompetence, racism and coverups from police, the judicial system and attorney generals since 1970. Despite these scandals, “Teflon John” managed to win a fourth term in office in 1988, although with a significantly reduced majority: the PCs won 28 seats to the Liberals’ 21 and the NDP’s 2 seats. The fourth term is a classic example of “one term too much” – it was a real trainwreck for the PCs, and led to a Liberal landslide in the 1993 election. Nova Scotia and most of Atlantic Canada’s economies suffered in the 1990s, and NS was badly hit by the fisheries crisis which meant a major decline in the fishing industry and job loses in the fish processing industries. If that was not bad enough, the wave of scandals which had begun hitting the PCs before 1988 became a tsunami which went up to the Premier himself. A former cabinet minister implicated Buchanan in cases of corruption and nepotism; it came out after he resigned from office that Buchanan had received about $1 million in PC party funds while he was Premier, including $40,000 annually to supplement his salary. Buchanan resigned in September 1990 and was named to the Senate by Prime Minister Brian Mulroney. His successor, after a PC convention, was Donald Cameron, who was left with the unenviable job of picking up the pieces. Cameron tried to clean up government and passed landmark conflict of interest, party financing and human rights legislation. The 1991 budget froze public sector wages and cut 300 jobs in the governments, and in 1992 he privatized Nova Scotia Power. His efforts to rebuild were hurt by the revelations of Buchanan’s finances, and by a 1992 mine disaster which killed 26. John Savage’s Liberals won a landslide in the 1993 elections, taking 40 seats out of 52 and reducing the PCs to only 9 MLAs. Savage was confronted with a terrible economic situation, which forced the Liberals to introduce a string of unpopular austerity budgets. Savage raised the sales tax, imposed a surtax on high incomes, curbed public sector wages, cuts jobs in the public sector and made major spending cuts in education and healthcare. Influenced by New Public Management tenets including ‘efficiency’, ‘privatization’ and ‘downsizing’, Savage at first cut back on patronage appointments and reformed the public sector, but Liberal pressure forced him to loosen his stance on patronage appointments. Savage was compelled to resign in 1997, and was replaced by Russell MacLellan. The 1998 election was a turning point in NS history. Although the Liberals won the most votes and 19 seats, the NDP made major gains and formed the Official Opposition, with 19 seats (up from 3), leaving the PCs with 14 seats. A year earlier, in the federal election, the NDP had won 6 seats in the province while the federal Liberals were shut out entirely due to Prime Minister Chrétien’s unpopular cuts to unemployment insurance and other programs. MacLellan remained in office for a bit over a year, forming a minority government with PC support. In July 1999, John Hamm’s PCs won a majority government with 30 seats against 11 apiece for the NDP and Liberals. Under Hamm’s first term, Cape Breton Island’s remaining steel mills and coal mines shut down entirely (in 2001). The PC government sold off Sydney Still Corporation, the provincially-owned operator of the Sydney steel mill. The federal Crown corporation in charge of the coal mines, DEVCO, sold all surface assets in December 2001. Otherwise, the PC government balanced public finances and cut taxes. Hamm’s PC government was reduced to a minority in the 2003 election, winning 25 seats to the NDP’s 15 and the Liberals’ 12. Hamm stepped down in late 2005 and was replaced by Rodney MacDonald, who sought a mandate of his own in June 2006. The PCs gained 3% in the popular vote, but suffered a net loss of 2 seats, being reduced to 23 seats against 20 for the NDP and a pitiful 9 for the Liberals, who, with only 23% of the vote, won their worst result ever. MacDonald’s government, worn down by some scandals, lost a confidence vote and was defeated by Darrell Dexter’s NDP in the June 2009 election. The NDP made major gains in both the popular vote and seat count, winning 45% of the vote and a majority government with 31 seats. The Liberals made smaller gains, winning 27% of the vote and 11 seats, but this was enough to place them in second. The governing PCs fell to third place with only 24.5% of the vote and 10 seats. Dexter, forming the first NDP government anywhere in the Atlantic provinces, governed in a very moderate fashion, going out of his way to appear as a centrist and ‘reasonable’ leader; something which has worked well for the NDP in Manitoba or Saskatchewan but didn’t prove successful for Dexter in NS. His government’s record was mixed, hardly a disaster but failing to live up to the high expectations voters had set in the NDP in 2009. Dexter’s backers point to his government’s fairly solid economic record. The province is projected to post a $18.3 million surplus (0.04% of GDP) in FY 2013-14 – one of only four provinces to do (BC, SK, QC, NS) and real GDP growth for 2013 is expected to be 1.7%. It had balanced the budget in 2010-11 but posted a small deficit since then. Credit rating agencies gave the province high ratings. His critics on the left, however, accuse him of doing so by embracing austerity (while the right criticized him for raising taxes). Dexter’s government made substantial funding cuts to education, health care and post-secondary education over a four-year period estimated at $772 million. It lifted the freeze on tuition fee increases, and undergrad tuition fees in the province have increased to an average of $5,934/student in 2012-13, one of the highest in the country. With unions, Dexter’s government proved only marginally more friendly than his predecessors’ governments, making some fairly limited changes to trade union legislation, although critics claimed that his changes were still too friendly to unions. The NDP was called out by left-leaning think-tanks such as the Canadian Centre for Policy Alternatives (CCPA) for doing little to improve labour standards. The left also criticized Dexter for abandoning rent control, a measure which was welcomed by landlords and business. Above all, perhaps, Dexter got lots of flack from the left for ‘corporate welfare’, ostensibly to create jobs. The government gave millions of dollars in loans or tax breaks to business including shipyards, an aquaculture firm and Imperial Oil. Were these wise investments which will create jobs in the long-term? Time will tell, but the NDP’s left-wing base didn’t like the optics of it much. By his first year in office, Dexter was hit by the MLAs expenses scandal, in which the Auditor General reported that many MLAs – from all parties, and incidents predating the 2009 election – had filled excessive or inappropriate expense claims. The scandal, again, hit all three parties – two Liberal, one PC and one ex-NDP MLAs were all forced to resign – and Dexter himself had questionable expense claims of his own. Dexter’s government did a poor job of handling the scandal, in the process voters – who a few months earlier had seen the NDP as something new and a breath of fresh air – got angry at the government and disillusion set in. A major factor which has been cited to explain the NDP government’s unpopularity was that the party quickly lost touch with rural Nova Scotia, where the NDP had done tremendously well in 2009. The province’s economy has not been too shabby, but Halifax is one of the few regions which has actually prospered since the NDP came to power, while rural NS declined. To add to this perception of rural/urban disparities in growth, the NDP fumbled a number of rural issues, the most noteworthy of which was the December 2009 cancellation of the Yarmouth Ferry, which connected the southern municipality of Yarmouth with Maine; to make matters worse, the government announced and handled this decision in a aloof, disconnected manner which gave a strong impression that the NDP just “didn’t get” rural NS. The government, as aforementioned, was far from being a total disaster. On healthcare, the NDP was able to find a strong middle ground between closing rural ERs and keeping them open, in the form of Collaborative Emergency Care Centres (miniature ERs in small communities with paramedics and nurses). Although the cuts to education were criticized by some, others welcomed Dexter’s trimming of the education budget, arguing that the government was challenging school boards to identify savings and tackle the decline in elementary and secondary school enrollment. On environmental issues, the NDP government took a fairly strong stance on climate change and especially wilderness protection. The government’s energy policy hasn’t been well received by voters (disliking an increase in power rates), the opposition) and some industries (natural gas and wind power), but Dexter’s ‘Maritime Link’ scheme to to receive electricity from Muskrat Falls in Labrador has generated some positive responses. The project would diversify NS’s energy sources and reduce its historical dependence on fossil fuels. The NDP platform’s main planks included continuing to deliver balanced budgets (and decrying the ‘financial recklessness’ of the Liberals and PCs), reducing the harmonized sales tax (HST) by 1% a year in 2014 and 2015 to reduce it to 13%, taking the HST off ‘family essentials’ (strollers, children’s car seats) and keeping it off home energy, capping elementary school class sizes at 25 students, defending the Maritime Link project, adding five new Collaborative Emergency Centres and open clinics staffed by nurse practitioners. The Liberal platform did not delve deep into specifics and was filled with flowery language and pablum. The main planks emphasized by the Liberals included “standing up to Nova Scotia Power” by breaking Nova Scotia Power’s private monopoly and creating a regulated, competitive energy market; job creation (focusing on small businesses); balanced budgets (and criticism of the NDP’s corporate ‘handouts’); reinvesting in education after NDP cuts; healthcare and seniors. Deregulation of the energy market is a fairly right-wing plank, and the Liberal platform used populist rhetoric on the matter (‘enough is enough’, ‘standing up to Nova Scotia Power’ etc). The Liberals pledged to reduce the HST, but only when the province reaches a sufficient budget surplus. On healthcare, the Liberals proposed to cut provincial health boards from 10 to 2 and use savings to pay for more family doctors and reduce hip/knee replacement time. On education, the Liberals platform called for capping KG-Grade 2 classes to 20 students and Grades 3-6 classes to 25 students. On issues such as education, the Yarmouth Ferry or community services it does seem like the Liberals took populistic stances challenging the NDP on issues where its performance was criticized. In one of the ironies of Atlantic Canadian politics, the PCs might have been to the left of the Liberals in this campaign (although it’s a rather pointless point to argue), especially as the Liberals came to be defined with their ‘standing up to Nova Scotia Power’ stuff. On the issue of energy, for example, the PCs proposed to freeze electricity rates for five years (magically?) and lower renewable energy targets. Other PC platform planks included cutting the HST to 13%, creating 20k jobs (again critical of the NDP’s corporate welfare), reducing school boards from 10 to 4, cutting the number of district health authorities from 10 to 3 and a derided goal to increase the provincial population to 1 million by 2025. The Greens, who ran a full slate in 2009, only nominated 16 (/51) candidates this year. Their platform, for what it’s worth, included funding public rail transit across the province, mandating Nova Scotia Power to use 100% renewable energy by 2020, introduce a guaranteed annual income and removing parental income as a factor in student loan system. Turnout was 59.08%, virtually unchanged from last time (58%). This is, by recent historical standards, very low. Changes compared to the 2009 election. For once, the pollsters were right. Canadian pollsters have had a tough time, for some reason, calling provincial elections; the most recent and memorable case being that of the BC provincial election in May; the BC NDP was widely expected to defeat the incumbent BC Liberal government, but the Liberals were reelected with a substantial margin of victory over the NDP. Some believed that the same thing could happen in Nova Scotia, although the NS Liberals’ lead in polls in the final stretch was far larger than any lead the BC NDP (or Alberta Wildrose in 2012) held in the final stretch; the NS Liberals led the NDP by about 20 points in all the final polls. The pollsters generally correctly predicted the Liberals and NDP’s share of the vote, perhaps slightly overestimating the Liberals (but by 1-2% at most) and NDP (again by 1-2% at most). In turn, they underestimated the PCs by about 1-3%. What was most surprising about the results was how poorly the NDP ended up doing: not only did they get trounced for reelection (unsurprisingly) but they placed third in the seat count, meaning that Jamie Baillie’s PCs will form the Official Opposition to the Liberal government; the first time the NDP has failed to place first or second since 1993 (which predates the emergence of the NDP as a potent force in NS politics) and the worst NDP result (in seat and % terms) since that same date. The NDP did place second ahead of the PCs on the popular vote by a few decimal points, but they won 3 seats less than the PCs did; mostly, I think, because the NDP got screwed over in Halifax, which was also rather surprising. Premier Darrell Dexter lost his own seat by 31 votes to the Liberals – one of those surprising Liberal gains in the HRM. I haven’t analyzed the NDP’s vote distribution at all, but I have a hunch that its vote was more evenly distributed than the PC vote and, hence, ended up losing a number of tight races to the Liberals/PCs. What is also remarkable, by glancing at my map’s shading above, is how tight almost all of the NDP seats ended up being. The NDP did not win any seat with a margin over 10%; in fact their biggest victory was a 5.8% margin in Truro-Bible Hill-Millbrook-Salmon River and a 5.6% margin in Sydney-Whitney Pier (a 573 vote majority). About 2,100 less votes for the NDP would have wiped them out and 2,100 votes extra would allow them to have 15 seats. In any case, Stephen McNeil’s Liberals won a large majority government, basically as impressive as Dexter’s NDP majority government in 2009. Unlike Dexter, McNeil was not able to thoroughly sweep rural areas – but he won his majority government by nearly sweeping the HRM (Halifax metro) and performing fairly well in rural parts of the province outside the old Grit stronghold in the Annapolis Valley and the Acadian counties. I explained some of the reasons for the NDP’s unpopularity above. A large part of the explanation can be summarized as being that the NDP failed to live up to the unreasonably high expectations that voters had placed in them in 2009, failed to create the “new politics” which everybody promises but which no politician actually delivers (of course) and forgot about its core electorate in going out of its way to appear as a centrist, fiscally responsible governing party. When you had these explanations to Nova Scotia’s contemporary political culture: low polarization, a very fickle electorate and three parties which run around in a circle ideologically; and the NDP’s defeat makes sense. The NDP had a decent run in office, but it failed to cater to its base and its attempts to break old stereotypes of the NDP as ‘anti-business’, socialist or ‘pro-union’ did not help it maintain its exceptional 2009 levels of support. The NDP, likely out of cabinet inexperience, mishandled a number of important events or issues (HST hike, expenses scandal, energy, Yarmouth Ferry, the case surrounding the tragic suicide of Rehtaeh Parsons, corporate welfare etc) and that hurt their credibility and support in voters’ eyes. In contrast, the NS Liberals were reinvigorated after a tough stretch in the wilderness since 1999. At least part of that likely comes as a ‘trickle down effect’ of federal political trends (the NS Liberals are still officially tied to the federal Libs) – a look at the polls over the NDP’s government shows you, for example, that the Liberals fell back into third place in polling for a while after the federal Liberals were decimated in May 2011. Now, the new Liberal leader, Justin Trudeau, is still rather popular across the country and the federal Liberals have posted massive leads over the NDP and Stephen Harper’s unpopular Conservative government in the Atlantic region since Trudeau won the Liberal leadership contest earlier this year. After all, Stephen McNeil tried to harness some of Trudeau’s support – Trudeau campaigned for McNeil at least once. Similarly, the PCs, held down by the unpopular MacDonald and Hamm governments, were likely further hurt by the unpopularity of Harper’s Tories in the region at the moment. The most surprising aspect of the result was the large swing against the NDP government in the HRM. Heavy swings were expected (and did materialize) in rural Nova Scotia, but most had expected that the NDP would manage to resist fairly well in the HRM, which is a traditionally Dipper region both provincially and federally. However, the heaviest swing against the NDP came in the HRM, the NDP’s vote share fell by about 23 points to 31%, a distant second behind the Liberals (49%). The NDP won only 2 seats against 18 for the Liberals in this seat-rich region of Nova Scotia. One of the seats which the NDP lost was Premier Dexter’s own seat, Cole Harbour-Portland Valley. The NDP only managed to narrowly save two of its seats in the HRM: Halifax Needham (with a 3.5% majority) and Sackville-Cobequid (with a 1.1% majority). Halifax Needham covers the city’s North End, a traditionally deprived working-class neighborhood which is also popular with students and other urban progressives. Maureen MacDonald, the NDP MLA since 1998 and outgoing finance minister, won reelection. Sackville-Cobequid is centered around the working-class suburb of Lower Sackville, an area which has been represented by the provincial NDP since 1993. That was it, however, for the NDP. The party was shut out of Dartmouth, even ridings like low-income Dartmouth North (lost by 14 – likely hurt by the stench of the former NDP MLA, forced to resign for the expense scandal) or blue-collar Cole Harbour-Eastern Passage (lost by 2). In Cole Harbour-Portland Valley, Premier Dexter likely lost because redistribution tacked on the Liberal/PC-leaning affluent neighborhood of Portland Valley to complement traditionally NDP blue-collar suburban neighborhoods such as Woodlawn and Forest Hills. The Liberals picked up Dartmouth South, a more middle-class seat which includes downtown Dartmouth, by 13 points. Liberal MLA Andrew Younger, a popular councillor who had gained Darthmouth East from the NDP in 2009, was reelected with 64% of the vote. In Timberlea-Prospect, a suburban/exurban seat west of Halifax, the NDP was hurt by the retirement of their wildly popular MLA Bill Estabrooks (70% of the vote in 2009) and the Liberals won the seat with 51.9% to the NDP’s 26%. The Liberals picked up other NDP ridings in the HRM including Halifax Atlantic, Halifax Citadel-Sable Island, Halifax Armdale and Halifax Chebucto. Halifax Chebucto has been held by the NDP since 1981 for all but one term, including by former NDP leader Alexa McDonough, although it is probably more middle-class (= more Liberal) and has different boundaries than in the 80s. The Liberals held the rather affluent middle-class suburban ridings of Bedford and Clayton Park West by huge margins, and picked up other exurban/suburban ridings (Sackville-Beaver Bank, Waverley-Fall River-Beaver Bank, Hammond Plains-Lucasville, Fairview-Clayton Park) from the NDP. In rural Nova Scotia, candidate personality/quality still plays a large role. For example, Colchester North MLA Karen Casey, elected as a Tory in 2009, was reelected as a Liberal with 61% to the PCs’ 26.4%. Yarmouth Liberal MLA Zach Churchill, who had picked up the seat from the PCs in a 2010 by-election, was reelected with 82% of the vote (the NDP won only 2.6% in the riding hit hard by the cancellation of the ferry). In Glace Bay, the depressed post-industrial (mining) riding on Cape Breton, Liberal MLA Geoff MacLellan was reelected with 80.4%. The Liberals’ hold on the Annapolis Valley is also due in part to personality, popular incumbents Stephen McNeil and Leo Glavine both won reelection with about 75% of the vote. On the other hand, in the redistributed (partly) Acadian riding of Clary-Digby, the Liberal majority was sharply reduced by the retirement of both of the new seat’s incumbents and the presence of a Francophone PC candidate: the Liberals won 54.7% to the PCs 31.1%. Acadians lean heavily Liberal, but they can easily vote for an Acadian Tory – Acadian Tory MLA Chris d’Entremont was reelected in Argyle-Barrington with 54.6%. A very disappointing results for the PCs was their failure to retake Cumberland North, a Tory stronghold which fell to the Dippers in 2009 on the back of a split in the Tory vote; the NDP lost the seat but the Liberals won with a majority of nearly 10% on the Tories. In Cumberland South, PC leader Jamie Baillie was reelected with 51%. On the other hand, the PCs retook all three of Pictou County’s ridings from the NDP, the Liberals are very weak (for some reason) in Pictou County and were not a factor; probably the only part of the province where the Liberals weren’t even in contention. On Cape Breton Island, the PCs lost one seat – Victoria-The Lakes – to the Liberals; their candidate, Pam Eyking, was the wife of federal Liberal MP Mark Eyking. Another federal Liberal MP’s wife, Kelly Regan, was reelected in Bedford (her husband is Halifax West MP Geoff Regan, himself the son of former Liberal Premier Gerald Regan). The NDP held its two industrial Cape Breton ridings with significantly reduced majorities. In good part, it seems that the government lost reelection more than the opposition won the election, although McNeil was a strong candidate in his own right and the Liberals ran a strong campaign. Regardless of the NDP’s successes in governing the province, their mistakes and gaffes hurt them badly and created a certain malaise within the electorate. Their defeat leaves them in a weak position, a third party in the legislature for the first time in over a decade, and leaderless for the time being. The Tories did not prove much stronger, despite placing second. The Liberals now face the tough time of governing. Just like the Liberals successfully attacked the NDP on energy and electricity rates, the Liberal government will likely be defined by its handling of one of its cornerstone proposals – breaking Nova Scotia Power’s private monopoly and the effect thereof on utility prices (an issue which contributed to the defeat of a few NS Premiers in the past…). However, the Liberals likely come in with much lower (realistic) expectations than the NDP came in with in 2009. By-elections for two seats in the Nova Scotia Legislature were held on June 22, 2010 after the sitting MLAs in Glace Bay and Yarmouth resigned in the wake of the Novs Scotian parliamentary expense scandals. The last general election was held on June 9, 2009 and government is formed by Darrell Dexter of the NDP. Though the next election is only due no later than June 9, 2014, Dexter’s NDP government has come out of its honeymoon with voters rather suddenly with the expenses scandal, which has affected MLAs from all parties. The latest poll had the NDP only 2% ahead of the Liberals, 37-35, while the PCs were in third with 24% support. Glace Bay Liberal MLA Dave Wilson resigned suddenly, likely due to his implication in the expenses scandal. Glace Bay is the traditional heart of the Cape Breton coal mining region and has long been a working-class seat, and was most recently held by the NDP between 1998 and 1999. Dave Wilson, a former TV and radio host, won the seat -then known as Cape Breton East (he lobbied for a name change) in the 1999 election – and has held it in 2003, 2006 and most recently in 2009. The NDP should have been able to win the seat in more clement conditions, and they polled 39.9% in 2009 against 47.4% for Wilson. The PCs have never been a factor in this working-class stronghold. The result is surprisingly good for the Liberals and rather poor for the NDP, who could have fancied a gain back during Dexter’s 2009 honeymoon period. Yarmouth PC MLA and former cabinet minister Richard Hurlburt was the first victim of the expenses scandal, being the top-spender in the current legislature (and second place when including defeated MLAs elected in 2006). He had claimed $33,220.18 in expenses, and that he had spent his constituency allowance on a generator and a 42″ television, which together cost over $11,000. Yarmouth is a rural town located at the southern end of Nova Scotia. Fishing and agriculture is the main economic activity, though tourism and light manufacturing has developed in recent years. The seat is a traditional Tory stronghold, having been held since 1999 by Hurlburt. Though the NDP won it in a shocking victory in 1998, the seat had previously switched between Tories and Liberals. The PCs were likely hurt by the bad press surrounding their resigning MLA, Richard Hurlburt and local discontent at such corruption in a rather small, rural, traditional and isolated community. However, it isn’t surprising that the Liberals are benefiting the most overall from the dip in Dexter’s popularity as a result of the expense scandals, given that the PCs remain without a permanent leader since their electoral defeat a bit more than a year ago and that they aren’t the official opposition. Two provincial by-elections were held in two Nova Scotian provincial constituencies on October 20, 2009. The constituency of Antigonish is located in north-eastern mainland Nova Scotia, centered around the university town of Antigonish (St. FX University), which is considerably progressive (as expected) – it was the only Nova Scotia town won by the Greenies (Elizabeth May, in this case) in the 2008 federal election. However, the surrounding area is much more Conservative federally, though the provincial riding was a rather Liberal seat until 1999. The seat, which seems to be rather Scottish (judging by names), was held by the Deputy Prime Minister of the Progressive Conservative (PC) government of Rodney MacDonald, Angus MacIsaac. The other seat, Inverness, on western Cape Breton Island, was held by his boss, PC Premier Rodney MacDonald, defeated in 2009 by the NDP. A largely Catholic seat, it is Liberal federally and used to be a Liberal areas provincially, though that Catholic Liberal base was rather destroyed by MacDonald’s Catholic appeal. The NDP government of Nova Scotia, elected in June, is still in it’s honeymoon period and actively targeted the seat of Antigonish, won by MacIsaac by only 295 in the 2009 election. The main winner is, of course, the NDP, which has gained votes in both seats, in addition to picking up Antigonish. The Liberal situation is more unclear, their vote was probably squished by the NDP effort in Antigonish but went up in Inverness, where the PC vote fell drastically with Rodney MacDonald gone. Inverness is also a traditionally Catholic Liberal area, so it might mean that the Liberals could be picking up a bit of the Catholic vote which MacDonald had won for the PC in 2006 or so. The clear loser is the PC, which lost votes in both seats and lost Antigonish. In addition, the Greenies had a bad night, but they’re irrelevant. However, these kind of things happen often in by-elections held a few months after the election of a new government: the Liberals picked up the seats of defeated Conservative premiers Bernard Lord and Pat Binns in New Brunswick and PEI respectively in by-elections held shortly after the Liberal Party’s victories. Nova Scotians voted on June 9 to renew the 52 seats in the provincial House of Assembly. As widely expected (by pollsters and pundits), the opposition New Democrats (NDP) swept to power in a crushing landslide both in terms of votes and seats. The governing Progressive Conservatives (PC), led by outgoing Premier Rodney MacDonald, were pushed to a pitiful third place behind the Liberals (who posted minor gains). Some surprising results on here. The NDP seems to have peaked in the Halifax-Dartmouth area. In fact, they actually lost Dartmouth-East to the Liberals and they haven’t won back the seat of Preston (large black community), which the NDP used to win in the past. The largest swings to the NDP were in rural areas – such as Cumberland North – definitely a big surprise. Cumberland North could be explained by the formerly PC-now-Independent MLA and the official PC candidate splitting the vote (their sum is superior to the number of votes cast for the NDP candidate), but the swing to the NDP there was undeniably quite massive. Also massive was the swing to NDP in Sydney (both seats are 70%+ NDP). I don’t know much about how the Cape Breton economy is doing now, but could it be an economic factor? The Liberal seats on the southwest coast have become ridiculously safe (huge margins, maybe a favourite son effect since the Liberal leader is from the region). For those who like historical tidbits, this is the first NDP government in the Atlantic Provinces (and the first east of Ontario). The Canadian province of Nova Scotia goes to the polls on June 9, a bit less than three years after the last election in 2006. The current Premier of Nova Scotia is Rodney MacDonald, Progressive Conservative (PC). MacDonald became Premier (and leader of the PCs) shortly before the snap 2006 election in replacement of John Hamm, first elected in 1999. The opposition defeated the government on a money bill, sparking a snap election which doesn’t really surprise anyone. Nova Scotia, a Atlantic province, was one of the founding members of Confederation, but also probably the most Confederation-sceptic. The Anti-Confederation caucus in Nova Scotia, led by Joseph Howe, a Reformer provincially, won all but one of Nova Scotia’s 19 seats in the first federal Parliament and won all but two of the 38 seats in the House of Assembly. Anti-Confederationism remained an important issue (in fact, a 1868 motion which refused to recognize the legitimacy of Confederation has never been rescinded), Joseph Howe coming around to the idea of Confederation. The Liberals, who had a larger base amongst the province’s farmers and fishermen, dominated until the pro-Confederation Conservatives (supported by United Empire Loyalists and the wealthy business milieus) won the 1878 elections but was defeated by the Liberals in 1882. In 1886, William Fielding won the election for the Liberals on a pledge to remove Nova Scotia from Confederation. Fielding’s pledge was never carried out and the Liberals turned to economic development (including railroad construction, roadbuilding, and development of the coal industry on Cape Breton Island). In 1906, the Liberal instituted prohibition, though the Liberals also gave women the vote and passed a number of progressive labour legislation. Fielding moved on to federal politics in 1896 and George Henry Murray became Premier, a title he held for 27 years (the longest unbroken tenure for a head of government anywhere in Canada). In 1920, the left-wing opposition led by the United Farmers and the Labour Party won 6 and 5 seats respectively. However, the United Farmers movement was quickly destroyed due to the Liberals bribing the party’s leadership or passing legislation which redistributed the provincial surplus to the MLAs (now there’s a grand idea!). Murray retired in favour of Ernest Howard Armstrong in 1925. However, Nova Scotia (and the Maritimes) had suffered an economic downturn and the Maritime Rights Movement gathered strength throughout the region. Running on a Maritime Rights platform, the Tories won 40 out of 43 seats in the 1925 election. The Conservatives curtailed federal influence on the province and introduced old age pensions, but also solved labour disputes with miners in Cape Breton Island. After winning a narrow re-election 1928, the Conservatives were victims of the Great Depression in the 1933 election. Hurt by the the depression, which had contributed into turning Nova Scotia from the country’s richest province per capita in 1867 to the poorest by the 1930s, the Conservatives were defeated by the new Liberal leader, Angus L. Macdonald. Macdonald held office between 1933 and 1940 and 1945 and 1954. Macdonald’s long tenure saw the development of roads, infrastructures, quality education and electricity in the province. In 1945, the Progressive Conservatives were wiped out, with the Co-Operative Commonwealth Federation (CCF), based in mining communities on Cape Breton Island winning two seats (the Liberals won 28). However, in 1948, Robert L. Stanfield, a “Red Tory” (in fact, a socialist in university and a life-long progressive) won the leadership of the PC Party. Since then, the PC has been of mostly moderate-to-Red Tory stock. The Liberals, divided since Macdonald’s retirement in 1954 along religious lines, lost to the 1956 election to Stanfield’s PC. Stanfield became leader of the federal PC in 1967, and the Liberals won the 1970 election. Due in part to the oil shock, the Liberals lost the 1978 election to the Conservatives. The PC lost the 1993 election to the Liberals in a landslide, thanks to disenchantment with the PC and a number of corruption scandals. John Savage, a fiscal conservative, became Premier, but was dumped by his party in favour of Russell MacLellan in 1997. In the 1998 election, the NDP (until then a fringe party limited to either Halifax Regional Municipality or Cape Breton Island) broke through and won 19 seats, tied with the Liberals. The PCs, with 14 MLAs, propped up the Liberal government until they defeated the government in 1999. In 1999, the PCs under the “shy MLA” John Hamm won a majority government, though this PC majority became a minority in 2003 and stayed one in 2006. As mentioned above, Rodney MacDonald, a Catholic from Cape Breton, became the PC leader and Premier before the 2006 snap election. The NDP has gathered significant strength in Nova Scotia since the late ’90’s. Throughout most of the post-war era, the NDP or its predecessor, the CCF, was either shut out or limited to a few seats. Until 1981, the CCF-NDP held all of its seats on Cape Breton Island. However, the university-urban wing of the party won out in the ’80’s when Alexa McDonough, a Haligonian, became leader. In 1981, the party won no seats on Cape Breton Island and only one seat in the province as a whole. McDonough became leader of the federal NDP in 1995. The NDP dominates in and around the HRM (Halifax Regional Municipality). It holds most seats in Halifax proper and dominates in more industrial Dartmouth and Cole Harbour. The Liberal holdouts have in common either Catholicism (Cape Breton is Catholic majority), or minority population (either Acadians or black). However, their one remaining Haligonian seat is a wealthy university constituency. Polls have indicated that the NDP is running ahead of the PC, and the latest poll even has the PC in a close third behind the Liberals, who seem to have returned to their traditional ’90’s level of support (which is low 30s or so). The PC campaign theme seems to be the economy, but also attacking a so-called “risky NDP”. The Liberals have vowed to cut taxes (like the PC), but their website offers little to no policy details. For completion’s sake, I note that the Liberal Party of Nova Scotia are affiliated to the federal Liberals.